"This manufactory, which was carried on by J W Pankhurst (& Co), is one of the oldest in Hanley. In the 1880's [? this should be 1780's], it was owned and worked by Charles Mellor. Mr Mellor made Egyptian black ware for the Dutch markets, as did his successors, Toft & Keeling, who also produced other varieties of earthenware. It was next carried on by Toft & May in the 1825 to 1833 period, and then by Robert May, who was succeeded by William Ridgway, who changed the manufacturer to that of white granite goods for the American markets and was succeeded by J W Pankhurst & Co. in about 1850. They continued (at Old Hall Street) until 1883. The mark used by the form was the royal arms and name, printed in black on the ware." 1883 Johnson Brothers The Johnson Brothers began production at the Charles Street works in 1883 - this works is long demolished and the site on the edge of Hanley town centre is a small shopping arcade and a WRVS centre. 1898 OS map of the Charles Street Works. Note how close the Sunday School is to the works - just out of sight below the Sunday School is a regular day school. For those who know the area the works position can be identified by the Butchers Market which still stands as the 'Tontine Shops' and is a listed building. 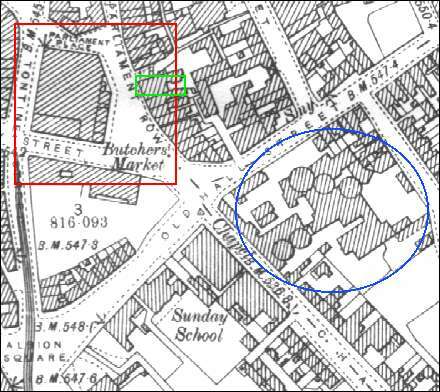 The shop marked in green is now a McDonalds. Bottom left is Albion Square where the Albion Hotel was built in 1902. Just out of sight in the bottom left is Hanley Town Hall.